Do yourself a favour and get along to the MCG! I’d been meaning to get to the G for ages. I finally made it to the ground and it was worth the trip. 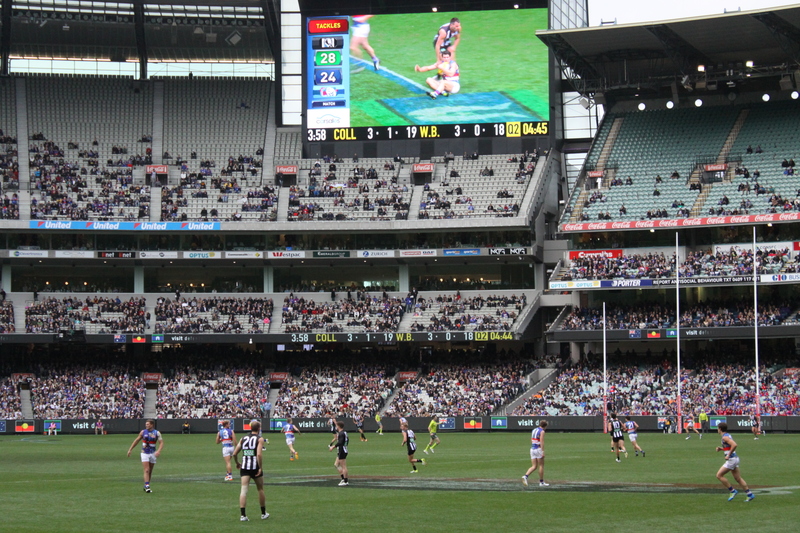 It was a few weekends ago and Collingwood vs Western Bulldogs were playing on a Sunday afternoon. The atmosphere is something else at the G and is the main reason to go. Also AFL is 1000 times better in person than on TV. Everyone says so and I agree. Collingwood supporters often boo when the other team has set pieces. Bulldogs fans do not. Bulldogs fans do not appreciate Collingwood fans. Magpies fans obviously don’t believe in the mantra of ‘keeping it classy’. Mrs TGOS – I’m guessing that is against the rules. Me – I’m pretty sure that is for a push in the back and the ref missed it. 50/50 call though. Mrs TGOS – I’m guessing that is also against the rules. Me – I’ve got no idea what that was for. If you go to the G you will get to see Blue Elmo. I think he might be Elmo’s cousin or Grover’s son. I can’t really work it out. I was just glad he was playing an instrument because I find his voice very annoying. Punter – Get on the ball Mason Cox. Punter – You are useless Mason Cox. Punter – You will be in the VFL next week Mason Cox. I’m hoping Mason Cox has a thick skin. Melbourne has a massive walk up crowd. We were sitting in one of the general admission sections on the lower tier and half an hour before the start of the game we could get a seat right on the boundary line. The section was about a third full. At the start of the game it was absolutely full. It doesn’t matter which sport you follow, the food at the ground is always prohibitively expensive. Always. When you go and get said food while your wife minds the seats, always bring your mobile phone because the sections all look identical and you will spend 1/2 an hour trying to find your seat again, even with a mobile. I think I would still be wandering around the MCG if I didn’t have my mobile. The AFL was great too. BTW Melbourne is an amazing city to visit. Great places to eat. The lane ways in particular. 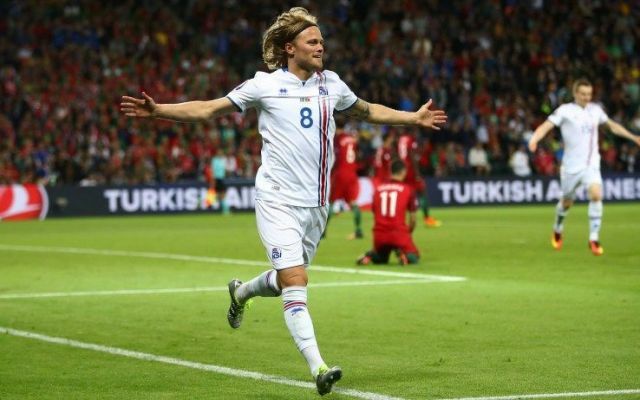 Euro 2016 – Still awesome. Now down to the business end of the competition and all of the favourites have shown cracks. Spain looked like world beaters until they lost against Croatia. Germany has looked good in patches. France likewise but left it late to win on most occasions. England looks amazing apart from putting the ball in the net, a big issue, one would think. State of Origin – Queensland are so resilient and NSW were so brave and could have won that in a heart beat. Great game. Dubs losing the NBA finals after being up 3-1. Just crushing. Next exciting episode will be on Thursday, 30 June 2016 titled ‘2016 NRL Second Trimester Report Part 1 – No Contenders Here’. This entry was tagged AFL, Australia, Australian Rules, Australian Rules Football, MCG, Melbourne Cricket Ground. Bookmark the permalink.